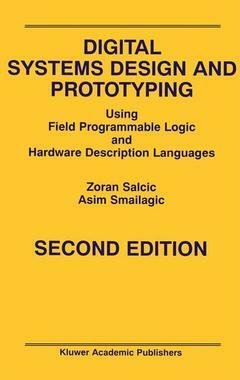 This title covers the subject of digital systems design using two technologies: Field Programmable Logic Devices (FPLDs) and Hardware Description Languages (HDLs). These technologies are combined to aid in the design, prototyping, and implementation of a range of digital systems. Preface to the Second Edition. 1. Introduction to Field Programmable Logic Devices. 2. Examples of Major FPLD Families. 3. Design Tools and Logic Design with FPLDS. 4. Introduction to Design Using AHDL. 5. Advanced AHDL. 6. Design Examples. 7. SIMP - A Simple Customizable Microprocessor. 8. Rapid Prototyping Using FPLDS - Vuman Case Study. 9. Introduction to VHDL. 10. Objects, Data Types and Processes. 11. VHDL and Logic Synthesis. 12. Example Designs and Problems. 13. Introduction to Verilog HDL. 14. Verilog and Logic Synthesis by Examples. 15. A Verilog Example: Pipelined SimP. Glossary. Selected Reading. Web Resources. Index.